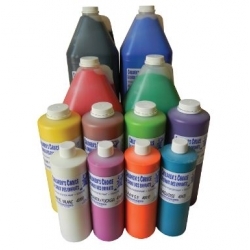 An economical tempera paint completely safe for use by even the youngest artists. Its thixotropic consistency maintains all ingredients in suspension and pours easily and gives good coverage and opacity. Freeze-thaw stable. Made in Canada. Non-toxic.